Competition within the telecommunications companies is growing fiercer by the day. Therefore, it is vital to ensure a high level of quality and reliability within all telecommunications systems in order to guard against faults and the failure of components and network services. Within large scale systems such quality and reliability problems are ever higher. The metrics of Quality and Reliability have to date only been available in journals and technical reports of companies which have designed or produced major parts of systems used in large applications. This book provides a self-contained treatment enabling the reader to be able to produce, define and utilise the metrics of Quality and Reliability required for the design and implementation of a large application such as a world class event as the Olympic Games. An additional outcome is that this book can be used as a guide for producing an ISO standard for large scale Systems such as the Olympic Games. This will prove highly informative for Practising engineers, researchers and telecommunications professionals, academics and graduate students in telecommunications, standards bodies and organisations such as ISO. 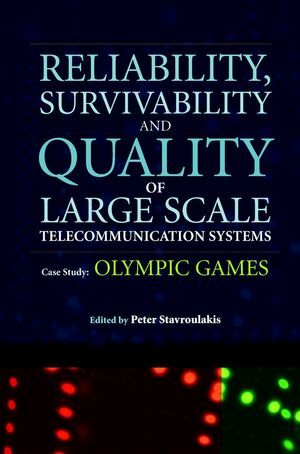 Peter Stavroulakis is the editor of Reliability, Survivability and Quality of Large Scale Telecommunication Systems: Case Study: Olympic Games, published by Wiley. Reliability of Emerging Internet-based Services (H. Eslambolchi and M. Daneshmand). Reliability Issues in IP over Photonic Networks (S. Arakawa and M. Murata). Key Issues in Survivable Cellular Systems (H. Sandalidis and P. Stavroulakis). Survivability in Wireless Mobile Networks (T. Dahlberg, et al.). Quality of Service Mechanisms in Multimedia Telecommunication Services (G. Rovithakis, et al.). QoS Metrics for Performance Assessment in Integrated Terrestrial-Satellite Multimedia Systems (A. Iera and A. Molinaro). TCP/IP-based Protocols over Satellite Systems: A Telecommunication Issue (M. Marchese). Outage Performance Considerations in Cellular Mobile Radio Networks (G. Karagiannidis and S. Kotsopoulos). Signal to Interference and Noise Ratio in Communication Systems as a Quality Measure (A. Sampath and D. Jeske). Quality Wireless Broadband Home Networking (H. Zhang). A Reliable ATM Switch Design (Z. El-Saghir and A. Grzech). Quality of Service via an Optimal Routing Model (E. Aboelela and C. Douligeris).